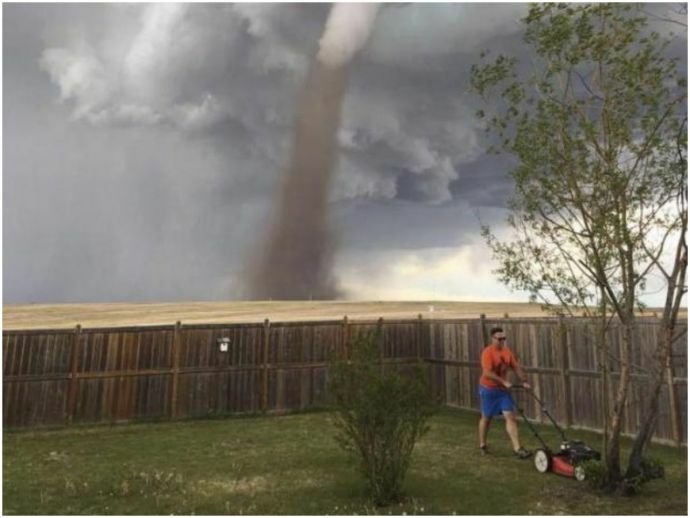 A picture of a Canadian man peacefully mowing his lawn with a menacing tornado swirling right behind him has caused a bit of a 'storm’ on the internet. The photograph of Theunis Wessels was snapped by his wife Cecilia Wessels on Friday evening as the tornado passed near their home in Three Hill, Alberta, Canada. Mrs Wessels said that the cutting of grass was on Thenius’ to-do-list, and as he started to do his task, she went for a nap. While talking to BBC, she said that she was woken up by her nine-year-old daughter who was upset that there was something like a twister in the sky, but her father wouldn’t come inside. Thenius said that he was fully aware of the tornado and that he wasn’t worried at all, as the tornado was about 2 km away from the home - much farther than it appears in the photo and it was moving away from them. He said he was keeping an eye on it. Thenius had recently attended a seminar organised by a storm-chasing organisation, so he had some knowledge about the tornados. The tornado was moving east - away from the house - and it disappeared in less than five minutes. It caused no injuries in the town and was reported to have caused only minor structural damages.